OO 8 x 4 - a sensible enough place to start? Re: OO 8 x 4 - a sensible enough place to start? OK you now have a double track oval! You can run three trains with that, one on each circuit and one shunting. 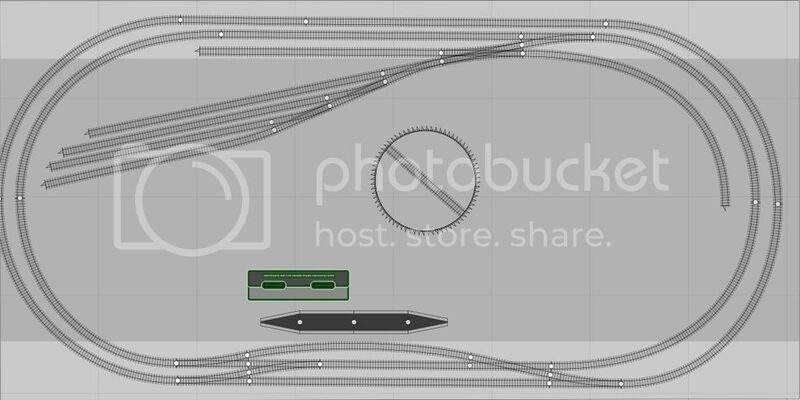 I'd get rid of the section of track past the station and that diamond crossing. You have the crossover from the outer to the inner track, add another going the other way (from the inner to the outer) just after it. That does what that strange piece of track with the diamond crossing does but a lot simpler and more prototypical! That's an improvement on your previous sketch, apart from the short loop with the diamond crossing, which doesn't achieve anything now. Use that in a double oval (with the slight dent to the inside : put a signalbox on the outside_. and you will have both the twin track option and the twice-round looped 8 option available in a compact space. For the the turntable: what is your longest loco? It won't handle large pacific locos, so if those are likely to appear, that's a non-starter.